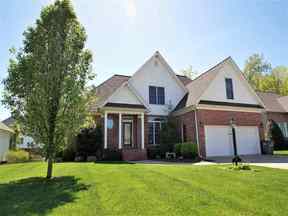 Fabulous 4 bed/3.5 bath home in Lake Forest subdivision located next to Rolling Hills Country Club! Vaulted ceilings, architectural moldings, hardwood floors, open concept, granite countertops, stainless appliances, main floor master with large bath! Upstairs are 2 bedrooms, full bath and a bonus room. In the basement is a family room with fireplace, bar area, 4th bedroom, 3rd full bath and golf cart garage. Outside is a covered patio and upstairs a deck. So much to offer 3,597 sq ft!